I would say that Albert Zugsmith's The Chinese Room (1967) is the ultimate cult film. I love crazy films that take a WTF approach in their execution, such as Blood Delirium (Bergonzelli), In the Folds of the Flesh ( Bergonzelli) and Top Sensation AKA The Seducers, to name only a few. 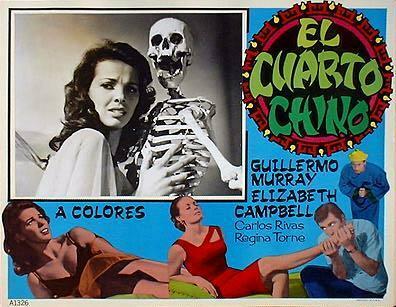 The Chinese Room, from Mexico, pre-dates and I think even outdoes the previously mentioned schizo classics. It plays like a Mexican soap opera having a bad fever while suffering a severe head injury. It starts out with the maid Consuelo being rescued from a suicide attempt, hanging from a tree in the garden. The suicide attempt brought on by being in love with her employer, the rich and handsome bank owner Nicolas Vidal. It seems Consuelo had been receiving letters and, as the examining Dr. Saluby points out, letters that she possibly even wrote to herself. "It's quite possible" he explains to the wealthy couple. He challenges Mr. Vidal to try it out on himself. He accepts, promising to write hundreds of threatening letters to himself in an "experiment of self hypnosis". is trapped in a loveless marriage and prescribes heavy doses of affection via regular injections of the good doctor's own throbbing gristle. Nicholas, in the meantime, has his own set of problems. He also starts receiving threatening letters as well since he's been carrying on a secret affair with his secretary who has a bizarre, hidden deformity. We find out later that he has been having the affair for 2 f-in' years and just now notices that she basically has a flesh hoof for one of her feet! Then we have eccentric Juan Cervantes, a longtime employee of Nicolas who introduces him to his "Chinese room". Cervantes, dressed in full Fu Manchu-type attire and quoting Confucius point out the evils of money. You have to ask yourself - how the hell could you construct such an elaborate and quite fancy room (giant gold Buddha statue! ), without a shitload of that same evil money? Anyway, who cares. He encourages Nicolas' further visits to his Chinese room. From there things get stranger. There are the most righteously groovy/gory dream sequences, Consuelo's eventual murder as she's found hanging from the same goddamned tree, and a mysteriously appearing and re-appearing deer hoof! Then it's a race against time as Nicolas has to find Consuelo's murderer or he himself will go to prison, being the #1 suspect. With the clock ticking to prove his innocence, he proceeds to eat a bunch of psychedelic mushrooms, gets behind the wheel, trips out, wrecks his car and crashes Dr. Saluby's jumpin' house boat party. Mrs. Vidal has a total psychotic breakdown that reminded me a lot of Rita Calderoni's multiple breakdowns in R. Polselli's Delirium, made years later. I may be wrong here but I noticed similarities in style, plot and acting w/ Delirium. Definitely not a blue print but I would not be surprised if Polselli had seen The Chinese Room prior to directing Delirium. With that said, I strongly suggest that you seek this sucker out and partake in all of it's freaked out glory and screw all cult film pretenders. This is the real thing! BUY A SUBTITLED COPY NOW! Awesome review! Make we want to view this film immediately! Check the new link below the review!